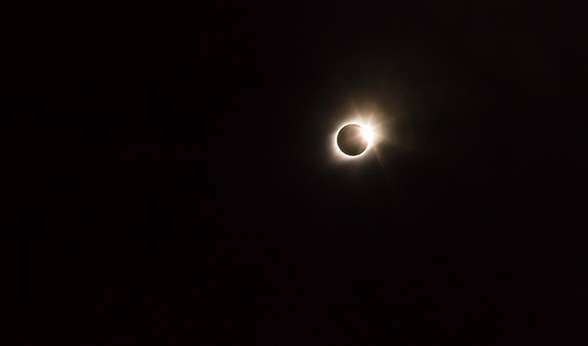 The total solar eclipse as seen from south-central Nebraska on Monday. Credit: Jeff Exstrum, University Communications. On Monday, just as CU Denver began the new academic year, an awe-inspiring solar eclipse captivated people across North America. A thin line of total solar coverage spanned, at various intervals, the continental United States, completely blocking out the sun from Lincoln Beach, Ore., to Charleston, S.C., for a few remarkable minutes. Mark Golkowski, PhD, acting chair and associate professor of Electrical Engineering in the College of Engineering and Applied Science at CU Denver, and several students collected data during this rare celestial event by using state-of-the-art Naval submarine communication technology. Traveling to remote areas of Colorado, Nebraska and North Dakota, Golkowski's small team of students collected data on how differing amounts of sunlight affect the upper atmosphere. The team was enthused about going into the field and collecting data unique to the total solar eclipse. "We were way out there! We're still waiting for all the data to come back to Denver, and we're excited about our potential findings," said Jamie Bittle, a graduate student in Electrical Engineering at CU Denver. In fact, they had never been able to conduct this type of experiment because it required a solar eclipse to occur with precise geometry between the U.S. Navy very-low-frequency (VLF) transmitter, the eclipse itself and the receivers. The Naval VLF transmitter is permanently set up outside of LaMoure, N.D. It is normally used as a communication device with the U.S. submarine fleet, and is also used to sense changes in the upper atmosphere, also known as the ionosphere. "In a nutshell, the students observed VLF waves that bounced off the ionosphere," said Golkowski. "The ionosphere changes drastically from day to night, and this affects how these radio waves travel. The solar eclipse offers a unique opportunity in that a day-night-day transition will occur over a few minutes rather than over many hours." Although the data is being gathered from each of the collection points, the team already has big plans for it. Golkowski's team will compare information from each point, and determine how the ionosphere changes due to sunlight, and how the traveling radio waves are affected. Using this information, they hope to improve VLF communication that is used by submarines and used as an alternative to GPS systems. This experiment may remain one-of-a-kind for the foreseeable future. "There have been total solar eclipses in the past and there will certainly be more in the future," Golkowski said. "But it's pretty unlikely that one will occur over the continental United States where we are able to set up receivers in line from a Navy transmitter. It's fortunate that this eclipse's path of totality occurred in areas accessible to us." The team hypothesized that during the field study they would be able to observe reflections from the path of totality for the very first time. Once this is understood, a similar model can be applied to sunsets and sunrises, and accuracy can be improved for technologies that use very-low-frequency radio waves like U.S. submarines. 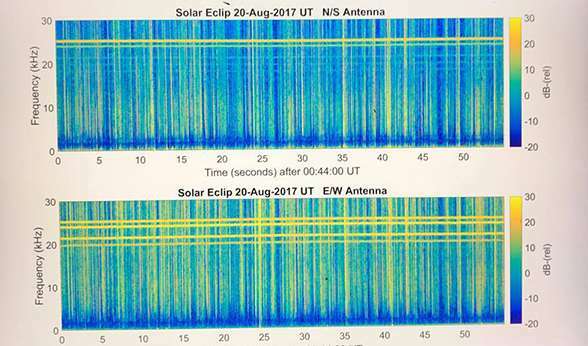 Although the 2017 solar eclipse has passed, its invaluable data will be used in years to come, and may end up redesigning VLF communication methods.